This all-inclusive colonial style beachfront resort features 364 guestrooms in a unique atmosphere of non-pretentious elegance. Situated on a 16-mile white-sand beach surrounded by lush gardens, it offers outstanding comfort and superior entertainment options. Guests enjoy “stay at one, play at three” privileges with the sister hotels Riu Bambu and Riu Naiboa. Clients staying within the RIU complex have free unlimited access to the New Splash Water World. 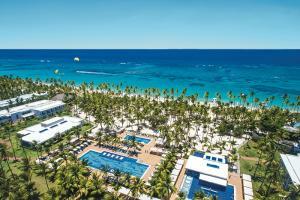 Located within the Riu Resort Complex in Punta Cana, and 21 miles from Punta Cana International Airport. Manati Park, Pirate Adventures, Dominican Cigar Factory, Saona and Catalina Island, Altos de Chavon Jeep Safari, Santo Domingo City.